Windows Admin Center 1809 and SDK now generally available! This blog post was co-authored by Samuel Li, Haley Rowland, Cosmos Darwin, and Daniel Lee, Program Managers, Windows Server. It’s been an exciting debut year for Windows Admin Center, the next-generation graphical management for Windows Server. Our team is committed to helping you manage your Windows Server infrastructure and instances, wherever they run, more easily and more efficiently. This includes delivering a platform and core set of experiences that improve day-to-day Windows Server administration, as well as lighting up new functionality and scenarios to help your organization unlock the full power of the Microsoft cloud. 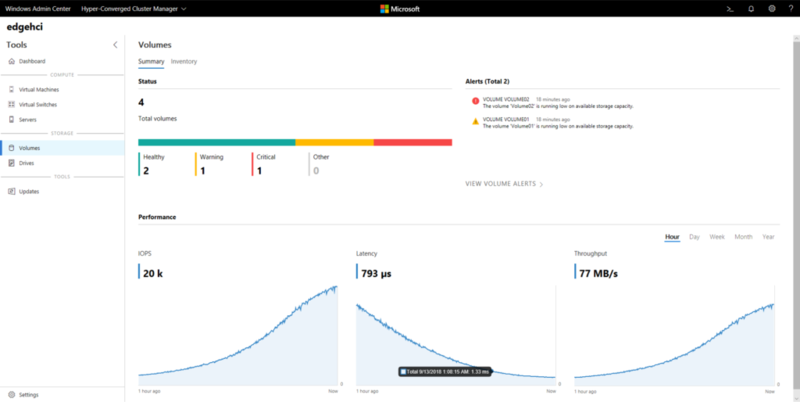 In April, we announced Windows Admin Center and general availability of version 1804, and shared the user and business value provided by our reimagined management experience. In May, we announced our SDK preview along with three launch partners to showcase the emerging value of the Windows Admin Center ecosystem. In June, at the Windows Server Summit event, we declared Windows Admin Center as the fastest growing Windows Server management toolset ever, exceeding 1,000,000 total managed nodes in just over 2 months after GA. In June, July and August, we continued with regular preview releases, each showcasing new and improved functionality through our Insiders program: Windows Admin Center Preview versions 1806, 1807, and 1808. Today, we are very excited to present the latest generally available release of Windows Admin Center in support of Windows Server 2019. We are also pleased to announce that the SDK is now generally available. As a platform, version 1809 of Windows Admin Center is generally available, and contains all the features and improvements of the previous monthly preview releases. As the number of capabilities grows, please note that some extensions and features are still clearly marked as “preview” to help differentiate newer functionality and allow for flexibility of ecosystem growth. Download: Go to ms/WindowsAdminCenter to download Windows Admin Center 1809 and browse updated documentation on a variety of relevant topics. For customers currently using version 1804 of Windows Admin Center, upgrade to version 1809 within 30 days to remain supported under Microsoft’s Modern Lifecycle Policy. View Script: See and copy the underlying PowerShell scripts for actions in supported modules, with syntax coloring. Scheduled Tasks: View, edit, enable/disable, start/stop, and create scheduled tasks. File Shares: View, edit, and create file shares and permissions in the Files tool and Storage tool. Installed Apps (Windows Server): View and remove Win32 applications which are installed. Apps and Features (Windows 10): View and remove Store and Win32 apps which are installed. Enable/disable Windows features. Hyper-V: Improvements include multi-VM bulk actions, VM and host settings including nested virtualization and hypervisor scheduler configuration, integrated VM Connect web console, and more! Failover Cluster: Added support for Cluster-Aware Updating, add/remove cluster node, validate cluster and an all-new cluster validation report UI. Hyper-V host settings on a cluster now allows you to make changes across all cluster nodes at once! Tags: Editing and filtering improvements to better group and organize large connection lists. Gateway settings: Improved categorization and updates to improve clarity. Notifications: Improved notification system provides a more organized experience. Windows Server 2008 R2: Supported as a connection target, with limited functionality. Azure Site Recovery: Protect business-critical workloads running on Hyper-V virtual machines from disaster. Azure Backup: Protect your servers from accidental-deletion of data, corruptions and even ransomware-attacks. 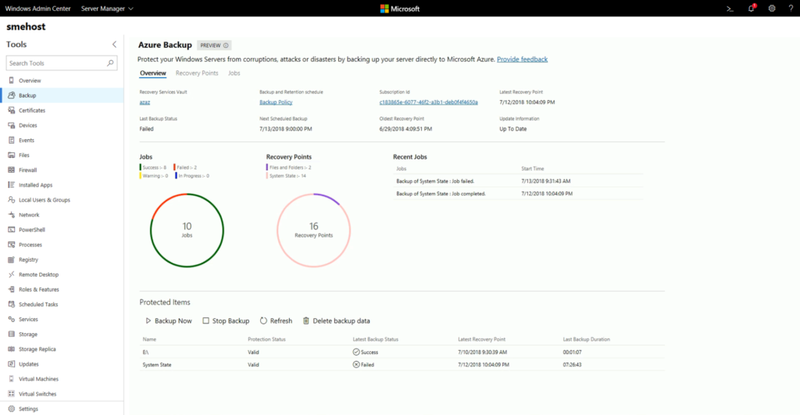 Azure Update Management: Manage operating system updates across all the servers in your environment. Azure AD authentication: Bolster the security of your Windows Admin Center gateway with features like conditional access policies and multi-factor authentication. Azure Network Adapter: Connect an on-premises Windows Server 2016/2019 instance to an Azure virtual network via simplified configuration of point-to-site VPN. 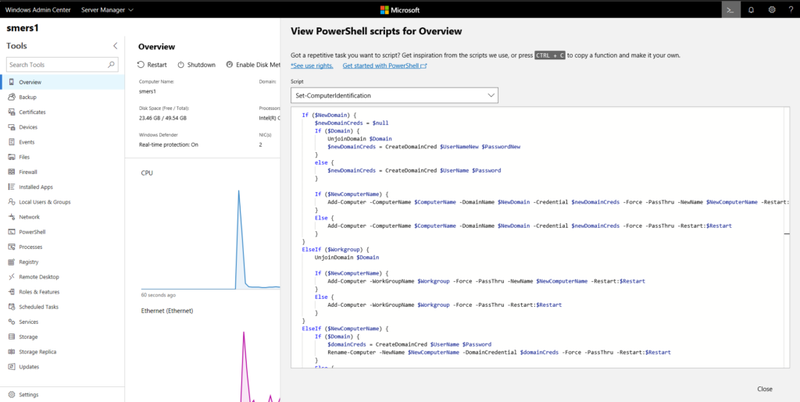 Manage Azure IaaS VMs running Windows Server: Granular troubleshooting or configuration using Windows Admin Center, wherever you run Windows Server instances. Windows Admin Center continues to be the best way to manage and monitor hyper-converged infrastructure, including Storage Spaces Direct and SDN, powered by Windows Server 2016 or Windows Server 2019. With this update, most HCI functionality is now generally available. Clustering and Hyper-V: All the new features listed above, including multi-VM bulk actions, add/remove node, and cluster-aware updating, apply to HCI clusters too. For Windows Server 2019 HCI clusters, the VMs list loads as much as 5X faster, and VM detail pages include performance history (hour/day/week/etc.). Storage Spaces Direct: Create, open, resize, or delete Storage Spaces volumes with just a few clicks. 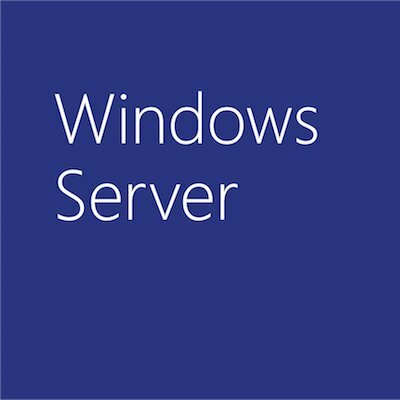 With this update, you can see pool reserve capacity and read/write cache statistics for Windows Server 2019 clusters. Software-Defined Networking: All-new tools and capabilities to manage and monitor virtual networks, subnets, connect virtual machines to virtual networks, and monitor SDN infrastructure. General: The HCI Dashboard and pages are more colorful, more consistent, load faster, and reflow better to different window sizes. Storage Migration Service: Migrate servers and their data without reconfiguring applications or users. It’s fast, consistent, and scalable while taking care of the enormous complexity and subtle environmental problems inherent to server migrations, all with an intuitive graphical workflow. Storage Replica: Set up and configure disaster protection easily via replication of volumes using Windows Admin Center. 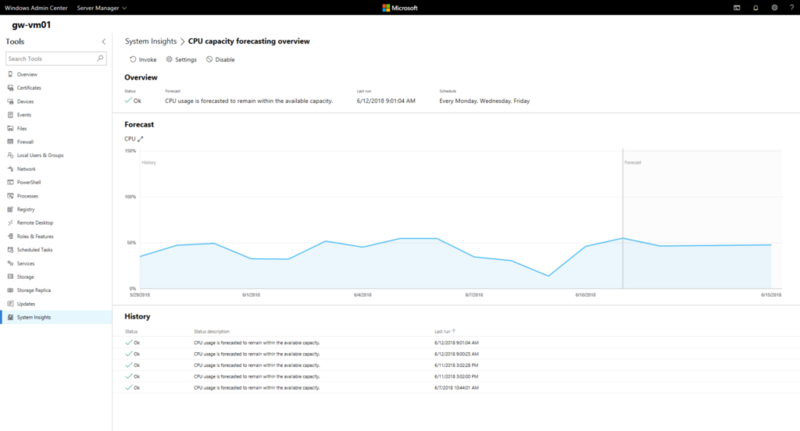 System Insights: Manage native predictive analytics capabilities in Windows Admin Center. Use rich visualizations and a simple management interface to understand future resource consumption across storage, compute, and networking. Extension Manager: Users can now get notified of available extension updates, update in just one-click, and use extensions from multiple extension feeds simultaneously. SDK: Now generally available after several months of validation by multiple partners building compelling extensions. Recent improvements include a CLI to help you get started quickly and easily, updated samples which leverage the latest features, new and improved documentation topics, and a new PowerPoint design toolkit to enable quick and consistent design mock-ups. Partners: The Windows Admin Center ecosystem continues to grow with more partners developing and releasing extensions for monitoring and managing servers, clusters, hyper-converged infrastructure and storage devices. DataON is releasing an all-new extension for HCI management, Fujitsu’s preview extension is now generally available, Squared Up provides unique monitoring capabilities based on SCOM, and Pure Storage is releasing an extension for FlashArray management. The following new partners are currently developing extensions and will be demoing their progress in their respective expo hall stations at Ignite: Cisco, HPE, Lenovo, NEC, QCT, and Riverbed.